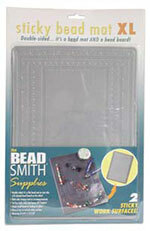 Great for keeping your beads from rolling away. The surface feels sticky but leaves no residue! One side is indented with U-channels like a traditional bead board to arrange jewelry pieces before stringing and the other side is flat. Both sides are marked with measurements in both inches and centimeters. When the mat starts to gather dust or debris, simply rinse it with water and let it dry. It will refresh and become as sticky as when it was new! Double-sided: two different work surfaces. Meaures 8.75 x 12.125 inch.